The past few years have been challenging ones for Computing education in the UK. After decades of national neglect, largely overlooked, from the county that invented Computer Science, there has been a sudden impetus to reintroduce computational problem-solving into the school curriculum. Immediate obstacles include a generation of children with no CS background and a need for tens of thousands of new or retrained teachers. The Computing At School (CAS) movement has been instrumental in this quantum transition from an IT to Computing syllabus, as have the British Computer Society (BCS), leading UK university CS departments and a number of major international technology companies. This piece looks at the background to this position and the progress being made to address these challenges. 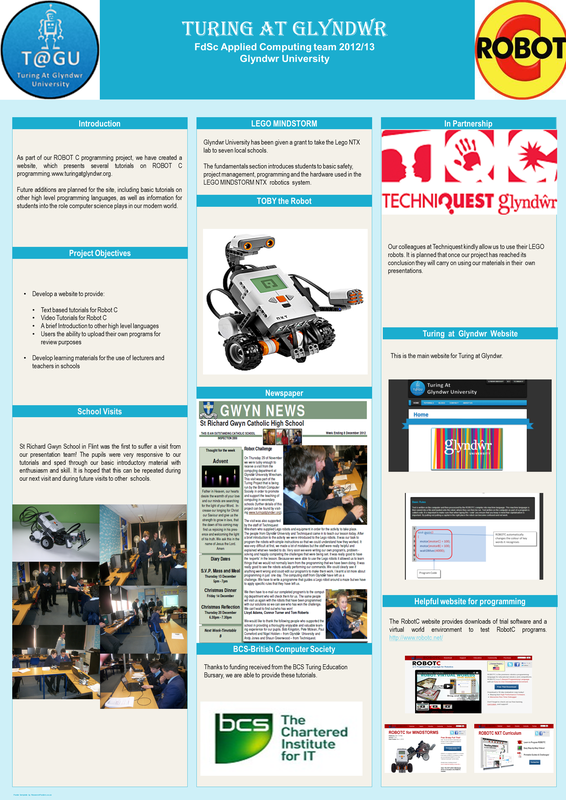 It describes, as an example of many, the work of the BCS-funded Glyndŵr University ‘Turing Project’ in introducing Welsh high-school students and staff to high-level programming and ‘computational thinking’. The Turing Project uses an innovative combination of Lego NXT Mindstorm robots, Raspberry Pi computers and PicoBoard hardware together with the Robot C and Scratch programming platforms. A few years ago, it became apparent that Computing education in schools in the United Kingdom, in common with many other countries in the world, had been in decline for several years. UK schoolchildren, rather than studying programming, computer systems, computational thinking and problem-solving, etc., had grown up on a somewhat unsatisfactory diet of Information Technology (IT) and Information & Communication Technology (ICT). A typical IT/ICT syllabus/curriculum from 2010 would include an uninspiring combination of coursework based mainly on office software and might conclude with a project in which students created a video or some other form of presentation. Although there were some outstanding schools bucking the trend, in most, conventional notions of Computer Science (CS) were conspicuously absent. In 2008, a group of CS enthusiasts and professionals formed the Computing At School (CAS) movement, with the stated objective of addressing these shortcomings. Numbers were small, and influence limited, for two or three years until a series of commissioned reports, professional endorsements and media stories served to raise the profile dramatically. Within a few months, government educational policy, noting a changing public tide, had shifted beyond recognition. Almost overnight, the problem had transformed from one of trying to find support for a radical new curriculum to that of preparing for it being somewhat hastily implemented. The immediate difficulty was then twofold. Not only were schoolchildren about to be immersed in an entirely unfamiliar syllabus but so were their teachers. Most estimates put the number of existing IT/ICT teachers unprepared for the new Computing/CS curriculum in the tens of thousands. In response, CAS, supported by the British Computer Society (BCS), the BCS Academy and the UK Council of Professors and Heads of Computing (CPHC) set about building the Network of Excellence (NoE), a national collaboration of trailblazing UK schools and universities and a number of major international technology companies, including Microsoft, Google, IBM, British Telecom and Facebook. Together they set about preparing UK schools for the CS revolution. The Computing Department at Glyndŵr University, Wrexham, commonly known as Computing@Glyndŵr (C@G) was heavily involved in CAS from its early stages and, in 2011, became the official CAS Hub for North, then North East Wales, coordinating development activity across a wide geographic area. C@G was also active in the CPHC with its successive Heads of Department serving on the national CPHC committee from 2010 onwards and chairing its Welsh region, the Council of Heads of Computing in Wales (Cyngor Penaethiaid Cyfrifiadura Cymru – CPCC). In 2012, the BCS Academy named their annual educational bursaries the ‘Turing Awards’, in honour of the centenary of the birth of Alan Turing . C@G applied for, and was granted, one of the 30 grants awarded and the Turing@Glyndŵr (T@G) project was born, initially planned to run over the academic year September 2012 to June 2013. A noted problem with the sparse population in North Wales was the difficulty schools often encountered in travelling fairly large distances to attend events at the only two North Wales universities (Glyndŵr and Bangor); both cost and school-day timings were often an issue. The T@G approach was therefore to take mobile CS workshops to schools around the region, with the BCS grant being used for transportation costs (vehicles and fuel). Whilst C@G were able to supply volunteer staff and students to run the project and develop its website, there was little finance from the grant left for equipment. Initially, seven schools in the counties of Denbighshire, Flintshire and Wrexham (Wales) and Shropshire and Cheshire (England) were invited to join the T@G project. Initial visits were made with small teams (three to five) of G@G/TQG staff and students working with school classes of between 20 and 30 children and their teachers. A typical introductory session lasted two to four hours with the only exceptional requirement of the hosting school being a reasonably large amount of floor or desk space available to experiment with the moving robots. The TQG laptops were usually necessary due to the tendency for school computers to be locked down and unable to download/install the Scratch/Robot C software. Sessions generally started with an introduction to the hardware and software to be used followed by a simple demonstration of the robots and boards. The first ‘challenge’ would be to extend the function of one of the examples in a trivial manner. Exercises would then become more challenging until – time, age-group and experience permitting – the children were solving more complex problems from first principles. The focus throughout was always on practical problem-solving and having fun. Teachers were always integrated into sessions, supporting the T@G teams in delivery but also gaining valuable experience themselves. Numerous examples can be found on the project website. Finally, after a lapsed period of two to three months, a second visit was made to each school. The robots and boards returned to the classroom and the students’ solutions could be implemented in practice and assessed. Progress was discussed and children and their teachers completed a feedback questionnaire. All students taking part in the T@G project provided feedback in one form or another, approximately 300 of them. Some completed written or on-line questionnaires; others were interviewed individually or in groups, some by the T@G team and some by their teachers. Questions were appropriately phrased for each age-group and time-frame. This range of tools and techniques naturally gives rise to a large and somewhat unstructured data-set. However, the overall impression was remarkable: students were engaged and enthused and the numbers finding the material interesting and relevant, or even considering careers or hobbies in Computing fields, rose sharply. Possibly the single most encouraging result was that nearly half the students genuinely considered the material fun in its own right, not merely in a school context. The T@G initiative is a very effective collaboration in terms of both the expertise and equipment all partners bring to it. In truth, an astonishing amount has been achieved in a short time, largely due to the enthusiasm and commitment of all the staff and students of the schools and other institutions involved. This is fortuitous since time is a luxury UK CS certainly does not have. The T@G model is a very cost-effective and time-effective solution to a real problem. Ultimately, the T@G model, its resources, exercises and experiences can be passed across to teachers for them to deliver themselves. T@G has demonstrated proof-of-concept of this hands-on approach and the value of this form of outreach delivery, particularly in rural areas. The intention now, already being put into practice, is to extend the project in both scale and scope. Using the evidence of the initial project, further funding, approximately six times the original amount, has been secured from another educational grant and more advanced robots and additional equipment are being bought. The C@G project is set to be extended across a wider geographic area, reaching more schools, with a larger range of projects and an enhanced website. Future students, if not engaged in the (to become) conventional CS GCSE route, will also be able to work towards a nationally recognised vocational award. This work was made possible through a British Computer Society (BCS) Educational Grant (under the 2012 ‘Turing Award’ Scheme), the generous support of Computing At School (CAS), Techniquest@Glyndŵr & Glyndŵr University, the enthusiastic involvement of staff and students at various schools and colleges in North Wales, Cheshire and Shropshire and individual commitment from many others, too numerous to mention. Sincere thanks to all. This entry was posted on Monday, October 21st, 2013 at 3:51 pm	and tagged with Alan Turing, BCS Academy, British Computer Society, Computer Science, Computing At School, Council of Professors and Heads of Computing, Glyndŵr University, Google, Lego NXT, North Wales, PicoBoard, Raspberry Pi, Robot C, Scratch programming and posted in Academia, Computer Science, Computing, Education, Hardware, Politics, Programming. You can follow any responses to this entry through the RSS 2.0 feed.